I go for Vietnamese Phở more in the winter time, than the rest of the year, so I thought I'd recommend one of my favorite places to go on Queen Anne. I think everyone has a favorite in each neighborhood in Seattle. 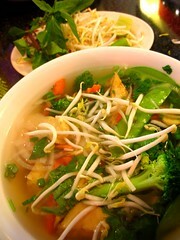 I'm mentioning Pho Viet Anh at 372 Roy Street, because that's the place I'll go during the work week with my co-workers. I think more than anything, the key to a good Phở is the broth. There's nothing more unsatisfying than a weak broth, let me tell ya. I ordered the vegetarian soup last time, thinking to myself that I hope it wasn't just like water and veggies, and it wasn't. Far from it. The broth was heaven! I even tasted my friend's chicken stock broth, and the veggie one was just as fulfilling and rich in flavor. Funny thing is, every time I go here, I usually get their Rice Vermicelli Noodles, because it's just too tempting and too good. This time, it was rainy and miserable out, and I had to go for the soup. It was delicious, and I will continue to go back to Pho Viet Anh as long as they have one of the best bowls of soup in town! The Dray: Best Little Pub in Town! "This is a damn good sandwich." "This is damn good beer." That's all you really need to know about a new little pub we discovered over a month ago, called The Dray. Located on NW 65th street, just across from the Goodwill, where we were originally trying to get to that day but it was so crowded we decided to get some lunch and ran into this awesome place. If you love trying all sorts of beer, watching soccer or football (Both American and English types), hot interesting grilled sandwiches, and friendly owners, you will love The Dray. If you want a menu with a 100 items on it, and a bunch of tasteless fried crap, don't come here. They list their beer according to color on the menu, which is actually very helpful whether you're a novice or a connoisseur . 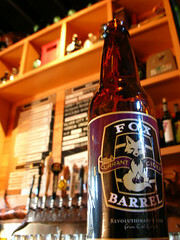 I ended up choosing a Fox Barrel cider (delicious! ), because I don't drink beer. My husband LOVES his beer though, even to the point of making his own home brew, so he was definitely perusing the beverage list for a long time, virtually in heaven. I can't remember what he got, but he ended up being very pleased with the two choices he made. I was a little low on protein that day, so I chose the Grand Salame sandwich. 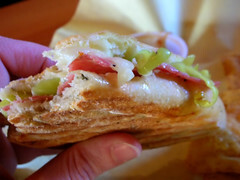 Filled with Genoa salame, provolone, sliced pepperoncini, basil aoli on a Macrina herb roll, the flavors danced in my mouth, doing the cha-cha between tangy and hot all over my tastebuds. I kept thinking to myself, "Why don't I do this at home?!" And proceeded to ponder the thought of blowing a wad on a fancy Calphalon panini press. "Nah...I'll just come here." I decided. 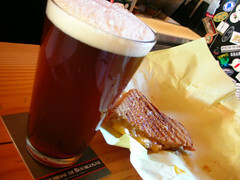 My husband Darren, who rarely finds anything vegetarian to eat at a pub, totally grubbed on their Grilled Cheese that had English sharp cheddar, pear chile chutney on Macrina whole wheat cider bread. I caught him humming and "mmm'ing" as he shoved his face with the gooey sweet and salty toasted sandwich of love. I tasted it too, and moaned. So yea...basically, GO CHECK OUT THE DRAY! It's a tiny place, too, so if you come with a big group, just be prepared to get a little cozy.